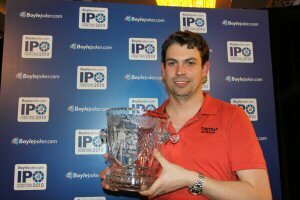 The title for the €180 + €20 buy-in Boylepoker.com International Poker Open has returned home after Irishman John Gray slayed his way to the top of what continues to be Europe's largest poker event. He received the first-place prize of €50,600 for a top-notch performance. The IPO ran from October 15 to 17, and over two starting days, Dublin's Regency Hotel heaved with 1,293 players. This included a mix of amateurs, Internet qualifiers, Boylepoker pros, celebrities, and international legends such as Marty Smyth, Neil Channing, Surinder Sunar, Liam Flood, Paul Marrow, Andy Black, "Mad" Marty Wilson, Padraig Parkinson, and Jessie May. On day 2, 121 players took a slice of the €252,740 prize pool, which included €20,000 added by Boylepoker.com. It took nine hours and 21 minutes to find a champion including an explosive final table, which witnessed numerous all-ins and ever-changing chip stacks. The ultimate hand of the 2010 International Poker Open came when John Gray busted heads-up opponent Eddie Landy with pocket jacks versus 10d 4d respectively. On a board reading Ac Qd 8h 7d Landy needed a diamond on the river for a flush. However the event's final card to hit the felt was the 3s, making Ward €50,600 richer, and sending Landy out with the runner-up prize of €33,683. After his win, 28-year-old Gray said, "I feel great, it's a bit surreal. I don't know what to think, I can't believe it but it will probably sink in tomorrow." Lisa Condon of Boylepoker.com said, "This year's International Poker Open was as exciting as ever. The success and popularity of the event boils down to the spirit of those who take part and the hard work of everyone on the team. The IPO has proven itself to be an event for every level of player, giving amateur players the chance to sit next to professionals and soak in the experience of what it is like to play a major live tournament at a low cost. We're already looking forward to next year!" The event was streamed live at Boylepokerblog.com. Extensive coverage such as photographs, chip counts, interviews, and videos from the event can also be found on Boylepoker's blog in the IPO 2010 section. Boylepoker is part of the biggest European poker network - iPoker. Players have access to a huge range of tournaments running around the clock with massive guaranteed prize pools and the opportunity to qualify for prestigious live events. The company does not accept players from the U.S.